Shirts With Random Triangles: Ole Miss DB DD Bowie leaves football program, signs with JUCO school. 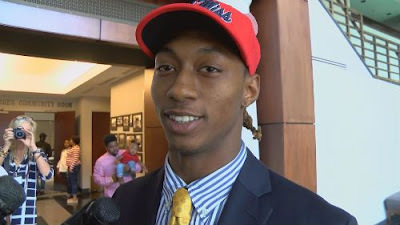 Ole Miss DB DD Bowie leaves football program, signs with JUCO school. DD Bowie. Image via msnewsnow.com. D.D. Bowie is an ex-Rebel. The now-former Ole Miss defensive back has decided to leave the program for what head coach Matt Luke referred to in a statement as “personal reasons." Bowie has signed with Northeast Mississippi Community College, which means he can play football at a JUCO level for one season while waiting on pesky NCAA transfer rules to follow their course. Bowie was responsible for six tackles during the 2017 season, playing in seven games, and starting in one.